Mark Scerri (right) of Sliema Wanderers attempts a pass despite Qormi's Yannick Yankam's pressure. 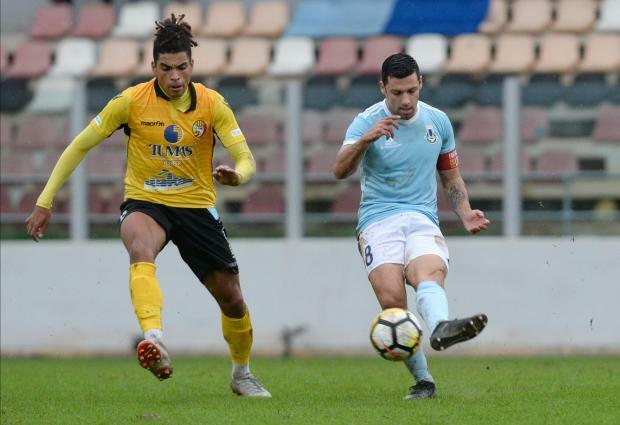 Sliema Wanderers were back to winning ways after a comfortable win over Qormi. It was a legitimate one given the edge of Sliema over their opponents. A tame opening had Matias Muchardi hitting a free-kick which took a deflection off the wall on its way out. It was Jamie Azzopardi’s turn to foil Muchardi when the Qormi goalkeeper fisted away his effort from another set-piece. Sliema’s methodical and control play was restricting Qormi in their own half. On the half hour mark, the Qormi’s goalkeeper was stretched into an excellent save on Claudio Pani. Two minutes later, Younes Marzouk’s cross-shot had a gaping Qormi’s defence staring as Azzopardi pushed away the effort, only to see Mucciardi timing his run perfectly before stabbing the ball past the goalkeeper. One minute before half-time, Azzopardi once again, came to his team’s rescue when he somehow kept his balance to tip over Marzouk’s close-range header. On the other side, Seo In Kim’s pin-pointed cross from free-kick, seared across goal and onto the head of Alexsandro Ferreira but the Brazilian’s effort was grandly turned to corner by Jake Galea. The surface grew increasingly slippery and there was a lot of slithering and dithering inside the Qormi with the ball getting stuck in a patch of mud. The Wanderers kept going at their opponents. Sliema’s menace could only come from the occasional hopeful shots from a distance. Marzouk dinked the ball into Azzopardi’s hands. The Blues’ confidence resurfaced and twenty minutes from time, Jefferson ran briskly throught the middle before hitting a low drive into the corner of the net. Sliema's Marzouk was voted the BOV player of the match.